"Detached" redirects here. For other uses, see Detachment (disambiguation). a single-family (home, house, or dwelling) means that the building is a structure maintained and used as a single dwelling unit. Even though a dwelling unit shares one or more walls with another dwelling unit, it is a single family residence if it has direct access to a street or thoroughfare and does not share heating facilities, hot water equipment, nor any other essential facility or service with any other dwelling unit. In some jurisdictions, allowances are made for basement suites or mother-in-law suites without changing the description from "single family". It does exclude, however, any short-term accommodation (hotel, motels, inns), large-scale rental accommodation (rooming or boarding houses, apartments), or condominiums. Most single-family homes are built on lots larger than the structure itself, adding an area surrounding the house, which is commonly called a yard in North American English or a garden in British English. Garages can also be found on most lots. Houses with an attached front entry garage that is closer to the street than any other part of the house is often derisively called a snout house. 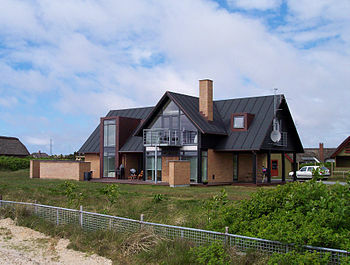 Terms corresponding to single-family detached home in common use are single-family home (in the U.S. and Canada), single-detached dwelling (in Canada), detached house (in the United Kingdom and Canada), and separate house (in New Zealand). In the United Kingdom, the term single-family home is almost unknown, except through Internet exposure to U.S. media. Whereas in the U.S., housing is commonly divided into "single-family homes", "multi-family dwellings", "condo/townhouse", etc., the primary division of residential property in British terminology is between "houses" (including "detached", "semi-detached", and "terraced" houses and bungalows) and "flats" (i.e., "apartments" or "condominiums" in American English). In pre-industrial societies, most people lived in multi-family dwellings for most of their lives. A child lived with their parents from birth until marriage, and then generally moved in with the parents of the man (patrilocal) or the woman (matrilocal), so that the grandparents could help raise the young children and so the middle generation could care for their aging parents. This type of arrangement also saved some of the effort and materials used for construction and, in colder climates, heating. If people had to move to a new place or were wealthy enough, they could build or buy a home for their own family, but this was not the norm. The idea of a nuclear family living separately from their relatives as the norm is a relatively recent development related to rising living standards in North America and Europe during the early modern and modern eras. In the New World, where land was plentiful, settlement patterns were quite different from the close-knit villages of Europe, meaning many more people lived in large farms separated from their neighbors. This has produced a cultural preference in settler societies for privacy and space. A countervailing trend has been industrialization and urbanization, which has seen more and more people around the world move into multi-story apartment blocks. In the New World, this type of densification was halted and reversed following the Second World War when increased automobile ownership and cheaper building and heating costs produced suburbanization instead. Single-family homes are now common in rural and suburban and even some urban areas across the New World and Europe, as well as wealthier enclaves within the Third World. They are most common in low-density, high-income regions. For example, in Canada, according to the 2006 census, 55.3% of the population lived single-detached houses but this varied substantially by region. 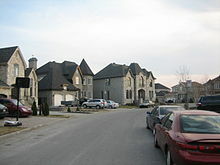 In the ville (city) of Montreal, Quebec, Canada's second-most populous municipality, only 7.5% of the population lived in single-detached homes, while in the city of Calgary, the third most populous, 57.8% did. Note that this includes the "city limits" populations only, not the wider region. The term "single-family detached" describes how a house is built and who lives in it. It does not indicate size, shape, or location. Because they are not often surrounded by other buildings, the potential size of a single-family house is limited only by the budget of the builder and local law. They can range from a tiny country cottage or cabin or a small suburban prefabricated home to a large mansion, aristocratic estate or stately home. Sizes in real estate advertising are given in area (square feet or square metres), or by the number of bedrooms or bathrooms/toilets. The choice in materials used or the shape chosen will depend on what is common to the vernacular architecture of that region, or the lasting trends in professionally designed tract housing. A traditional log and plaster hut, a timber frame and drywall North American starter home, or a European-style concrete-and-slate house are all varieties of single-family detached housing. The Saitta House, Dyker Heights, Brooklyn, New York, built in 1899, is a single-family detached home. Single-detached homes have both advantages and disadvantages. The entire space around the building is private to the owner and family, and in most cases (depending on national/federal, state/provincial, and local laws), one can add onto the existing house if more room is needed. They also typically have no property management fees, such as the ones associated with condominia and townhomes. These are often considered advantages. Since single detached homes are typically built in places where land is more plentiful, there is a distinct cost advantage per square foot (although this varies based on many factors, such as housing stock and land availability). This is mostly due to the cheaper cost of the plot of land that the house is built on. To many owners, single detached homes also offer a degree of privacy not seen in denser housing developments. The walls, floors, and ceilings aren't shared with others, so sounds between dwellings aren't as easily transferred. In addition, a level of freedom not seen in denser developments is afforded to owners of houses. Since the house is usually owned and not attached to other dwellings, the owner is free to do nearly anything with the interior, from repainting to remodeling, without disturbing others. Another advantage is that single family houses typically have private yards, which owners can use and landscape as desired (and within the confines of any homeowners' associations). Families with children also may find this advantageous, since neighboring kids can play privately together (as opposed to in public parks, whose upkeep, or lack of, is determined by a local governing body). However, all maintenance and repair costs — interior, exterior, and everything in between — are at the owner's expense. Amenities such as pools and playgrounds are usually absent, unless built at private expense, or if a municipal playground is available. Landscaping and lawn upkeep costs are at the owner's expense. From an environmental point of view, single-family houses are likely to require much more energy to heat in cold weather than buildings with shared walls, because of their very high surface-area-to-volume ratio. In wealthier countries, people who live in single-family houses are much more likely to own and use a private automobile rather than walking, biking, or using public transit to commute. The low density of housing leads to less frequent bus service and longer distances to commute, thus leading to increased car use. This makes single-family houses part of a much more energy and carbon-intensive lifestyle. The low-density nature of this type of housing requires using more land which could otherwise be used for agriculture or as natural habitat. Inner city neighborhoods of larger cities tend to be densely populated and without significant room for houses devoted to just a single family. By contrast, the outer districts of larger cities are usually transitional areas with equal shares of smaller apartment buildings and single-detached homes. 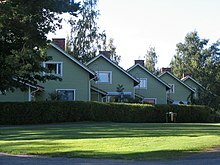 Culturally, single-family houses are associated with suburbanization in many parts of the world. Owning a home with a yard and a "white picket fence" is seen as a key component of the "American dream" (which also exists with variations in other parts of the world). Single-family homes can also be associated with gated communities, particularly in developing countries (e.g. Alphaville, São Paulo). For a more comprehensive list, see List of house types. Cottage, a small house. In the US, a cottage typically has four main rooms, two either side of a central corridor. It is common to find a lean-to added to the back of the cottage which may accommodate the kitchen, laundry and bathroom. In Australia, it is common for a cottage to have a verandah across its front. In the UK and Ireland, any small, old (especially pre-World War I) house in a rural or formerly rural location whether with one, two or (rarely) three storeys is a cottage. Bungalow, in American English this term describes a medium- to large-sized freestanding house on a generous block in the suburbs, with generally less formal floor plan than a villa. Some rooms in a bungalow typically have doors which link them together. Bungalows may feature a flat roof. In British English it refers to any single-storey house (much rarer in the UK than the US). Villa, a term originating from Roman times, when it was used to refer to a large house which one might retreat to in the country. In the late 19th and early 20th centuries, villa suggested a freestanding comfortable-sized house, on a large block, generally found in the suburbs. In Victorian terraced housing, a villa was a house larger than the average byelaw terraced house, often having double street frontage. Mansion, a very large, luxurious house, typically associated with exceptional wealth or aristocracy, usually of more than one story, on a very large block of land or estate. Mansions usually will have many more rooms and bedrooms than a typical single-family home, including specialty rooms, such as a library, study, conservatory, theater, greenhouse, infinity pool, bowling alley and server room. Many mansions are too large to be maintained solely by the owner, and as such there will be maintenance staff. This staff may also live on site in 'servant quarters'. ^ "Spending Patterns in Canada: Data quality, concepts and methodology: Definitions". www.statcan.gc.ca. ^ Inc., US Legal,. "Single Family Residence Law and Legal Definition - USLegal, Inc". definitions.uslegal.com. Wikimedia Commons has media related to Detached houses. "Australian Housing Types" (PDF). Your House teacher resource kit. Royal Australian Institute of Architects. Retrieved 15 January 2006.